Quitting smoking requires all three strengths in equal doses, just like the three sides of an equilateral triangle, which is considered one of, if not the strongest of geometrical shapes. Courage: the ability to do something that frightens one, or strength in the face of pain or grief. 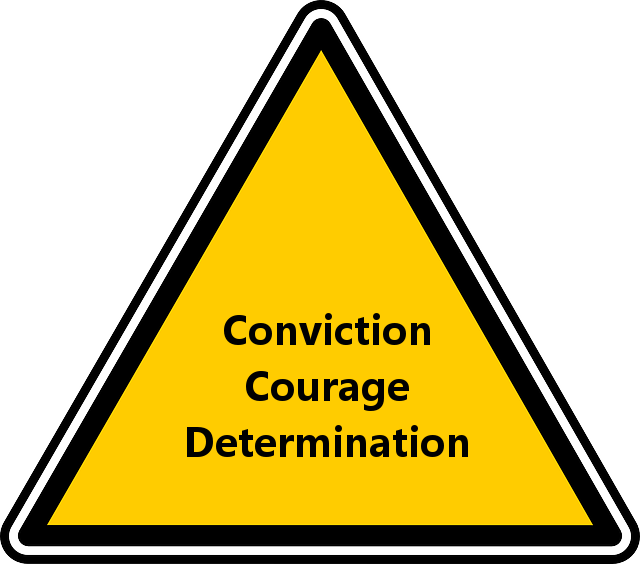 Determination: firmness of purpose; resoluteness. Conviction = a solid reason for why you want to quit. Courage = the ability to stand up to the difficulties you’ll face when quitting. Determination = a driving force within you to reach your goal. Many people who fail to quit do so because they are missing one of these elements. Their reasons for quitting don’t withstand the test of time. They give in too easily when confronted with the reality of not being able to smoke anymore, or they don’t have the resolve they thought they had to follow through. At least, until they are free of the addiction to nicotine and the psychological attachment to smoking. My point is that you shouldn’t just throw yourself into quitting smoking and hope that it works out alright. It’s much better to understand why you want to quit, learn about what to expect when you quit and learn to build that confidence to see you through to success. It may sound like a tall order, but it’s totally achievable! I like your blog and am impressed with how you are tailoring to the smoking cessation candidates. Keep up the good work! I am sending your posts to a friend who could use your insights.